Rodney Williams is a lifelong fisherman and a dedicated crafter of custom-tied flies and jigs used as fishing lures. He is the owner of R&S Bait Company in Gray, Tennessee. He learned this skill from his father, Sam T. Williams, who in 1985 designed a custom 3/16 oz. 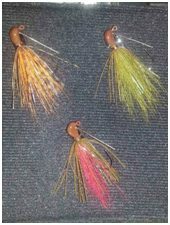 weedless “Arkie” jig. The finished jig consists of silicone rubber, deer hair, wire weed-guard, premium 3/0 black nickel hook, and a painted head. The jig is tied by hand with a premium thread. This bait was specifically made for the smallmouth bass fisherman. The jig has been the Williams’ number one seller from the beginning and continues to be today.